The long road from "go west, young man" to "stay put, everyone." In 1865, Horace Greeley said "go west, young man," and, for a century and a half, men and women, young and old, were keen to listen. Even into the early 2000s, the sunbelt stretching into the suburban southwest fattened with new housing developments—ultimately, to disastrous effect. But in the last decade, the ambition to go west has been replaced with a lazier notion—to "stay put." "Americans are moving far less often than in the past, and when they do migrate it is typically no longer from places with low wages to places with higher wages," Tim Noah wrote in Washington Monthly. "Rather, it’s the reverse." Why America lost her wanderlust is not entirely clear—perhaps dual-earner households make long moves less likely; perhaps the Great Recession pinned underwater homeowners on their plots—but those still wandering aren't going to the right cities. Washington is not a place to live in. The rents are high, the food is bad, the dust is disgusting, and the morals are deplorable. Go West, young man, go West and grow up with the country. Americans aren't simply moving to the states with the lowest unemployment (Oregon, Tennessee, and North Carolina all have jobless rates above the national average). More importantly, we aren't moving to states with the best records for low-income families getting ahead. In fact, we're often fleeing the best places for a upwardly mobile middle class. According to Harvard’s Equality of Opportunity Project, the states with the most upwardly mobile cities include Pennsylvania (with five of the top 12 cities), New York and New Jersey (Albany, Newark, and New York are in the top 30). 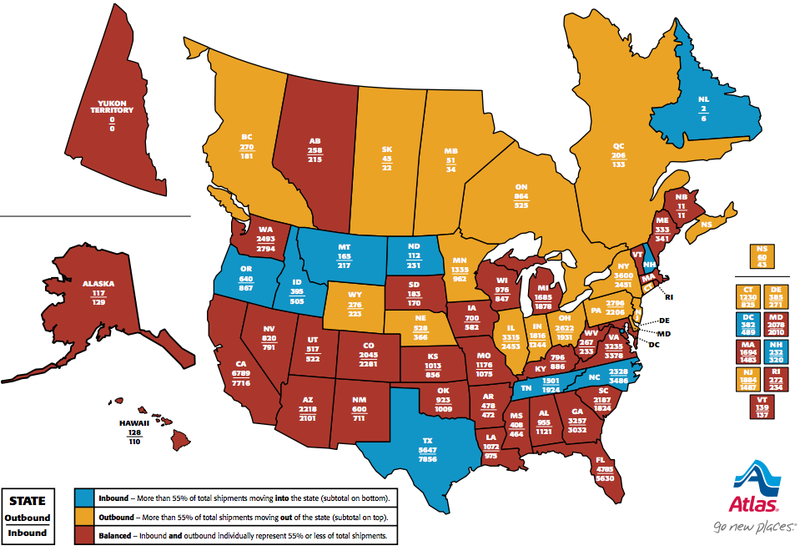 All three states are seeing net emigration, according to the Atlas map. Five of the 11 worst cities for poor children to move into the top quintile are in Tennessee and North Carolina—two of the few states to see more inbound moves in 2013. This doesn't make much sense if you envision American families rushing to the most promising metros. It does make sense if you see American families rushing to the most affordable homes. Some of America's most productive cities for medium- and low-income families—Boston, Honolulu, San Jose, New York—are also the most expensive. This is often due to (or at least, exacerbated by) exclusionary zoning and housing regulations that limit the number of available units, which drives up the price of housing, ensuring that low-income families can't afford to live there. The sad irony is that density is a good predictor of upward mobility, but sunbelt cities with affordable housing often sprawl deep into the exurbs, where families aren't anywhere near the best jobs. The very thing that makes those cities attractive places to get to also makes them bad places to get ahead. In the map above, every state had fewer inbound moves in 2013 than in 2004, except for two small states with relatively little traffic: Oklahoma and North Dakota. But the problem isn't just that Americans aren't moving as much as they used to. It's that the allure of cheaper housing—famously celebrated by Horace Greeley, himself!—often leads families to cities with the worst social mobility. The instinct to "go west" might doom families to go nowhere, at all.